Nevada Barr at The Poisoned Pen! When Tuesday, May 17 rolled around, Denis wasn't very happy. 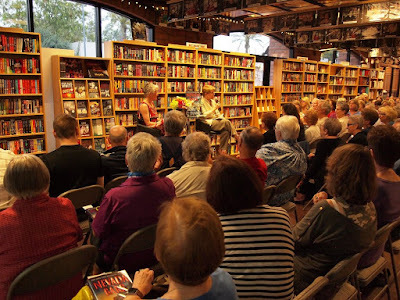 Between being a juror and his regular job, he couldn't join me in traveling to The Poisoned Pen to see one of our favorite authors, Nevada Barr. 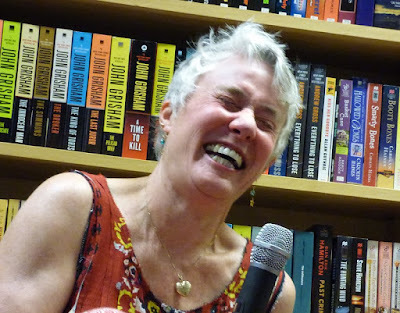 Nevada was here to sign her nineteenth Anna Pigeon mystery, Boar Island, which is set in Maine's Acadia National Park. 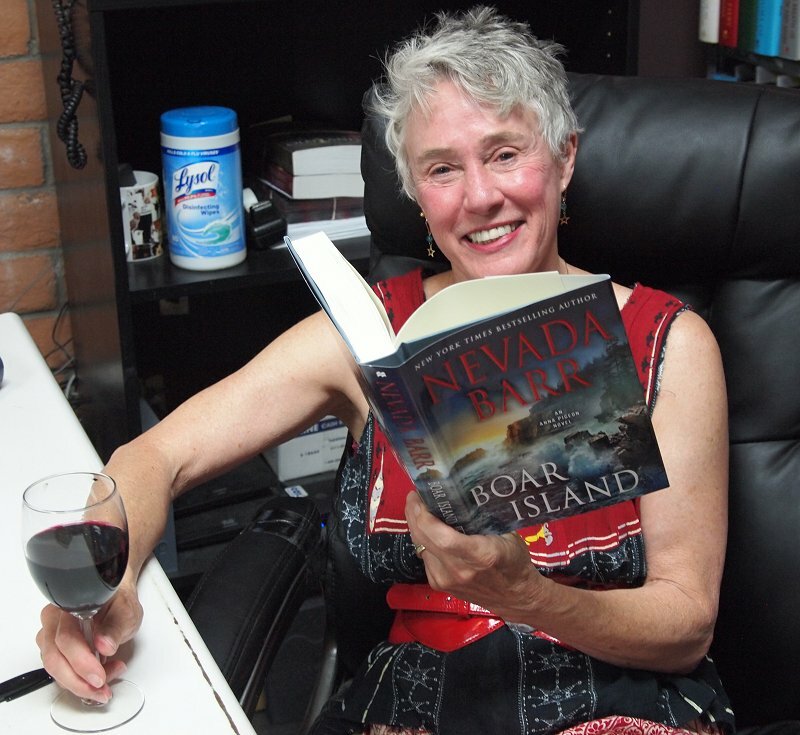 While Nevada was in the backroom signing mail order books, host Barbara Peters joined us early. She sat quietly for a couple of minutes to gather her thoughts, then proceeded to tell us-- as usual-- about some of the upcoming events at the store. Then she started talking about what was really on her mind. The Poisoned Pen will often give away advance reading copies of books to people who attend events. It's one of their ways of saying thank you, and they have a special stamp that they use to mark the insides of these books. Well, the winner of one of the books was the very first person to post his (or her) review on Amazon. He trashed the book, which didn't particularly bother Barbara. Two things about the review did bother her. A lot. (1) The reviewer included the entire plot of the book, ruining it for anyone who hadn't already read it. (2) He began his review, "I got a copy of this book from The Poisoned Pen." "Do you have any idea how many emails I've gotten from the publisher?!?" she asked us. From the look on her face, it was quite a few. Actually there were three things that had made her unhappy. The person's review was anonymous (number three). I don't care for that myself. It's too easy for people to say every hurtful and/or untrue thing they can think of online because they're hiding under a cloak of invisibility and feeling powerful. 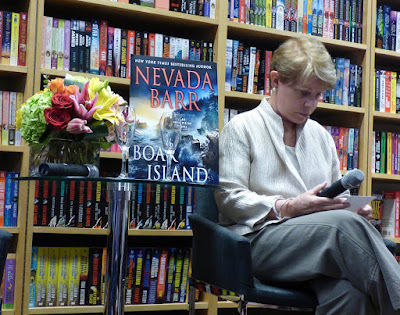 While most of us were sitting there thinking unkind thoughts about an anonymous reviewer, Nevada Barr came out like the sun through the clouds. Nevada has appeared at The Poisoned Pen for all but two of her books. "Barbara and I have been together longer than all my marriages put together," Nevada quipped. Partial view of the crowd courtesy of Jeff K. of The Poisoned Pen. The main focus of Boar Island is cyber bullying. Nevada was alternately fascinated and disgusted by cyber bullying, especially the fact that there is really no way to defend against it. "I liked having a villain who was so built into the social media," Nevada said, "that you could not extricate him... and then extricate him." One of the trickiest things for Barr to accomplish in this book was to get all her characters to the place where she wanted the mystery to unfold: Acadia National Park in Maine. Acadia is one of the most heavily used national parks in the country. "I've been working on this book for a long time. I was constantly being derailed by other books," Nevada said. "This is a follow-up to Destroyer Angel, isn't it?" Barbara asked. "It's not a follow-up in that it doesn't start up right after Destroyer Angel left off, but I do bring several of the characters back in Boar Island. I fell in love with Heath and Elizabeth, and I wanted to spend more time with them," Nevada replied. "I also wanted Anna to have a position where her duties would not interfere with her work in my book." 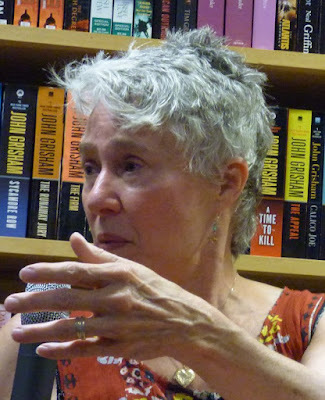 Barbara mentioned how many awful things have happened to Anna Pigeon through the course of the series. "Yes, it's so much more fun to beat up an older woman-- but it's harder!" Nevada joked. Talk segued to some of the earlier books in the series, like two of my particular favorites, Firestorm and Blind Descent. Barbara asked the author if she were writing through her own personal fears. "I'm kinda out of fears now. I need some more neuroses to write about," Nevada said. 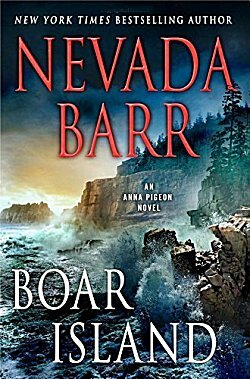 After Nevada told us that she created Boar Island and placed it next to the real-life Bear Island in Acadia, Barbara asked her, "So what happens to Anna? She arrives...?" After the laughter died down, Barbara said, "You're right, there's not a lot we can say about the story without spoiling it for everyone here." Several of us were wondering where Anna will be going next. "I just got back from Olympic National Park-- and I still haven't done my Grand Canyon book!" the author said. Nevada knew it was time for her to retire from the Park Service when she stopped a man to give him a speeding ticket on the Natchez Trace in Mississippi. "You have to have the person sign the ticket, so I handed it to him. He looked at my signature and said, 'Nevada Barr?!? Can I keep this?' I thought that was a sign that if I continued to write and work in the Park Service, I might be getting into a conflict of interest." Nevada Barr sharing a joke with us. Another fan wanted to know how she discovered the Dry Tortugas because he went there specifically because he'd read her book. "I almost had to be slapped upside the head to go," she replied. "There is the most fantastic snorkling there! Going there was a gift that was forced upon me." The book that takes place in the Dry Tortugas, Flashback, deals with Dr. Mudd, the man who took care of John Wilkes Booth's injuries after Booth assassinated Lincoln. "That book was very interesting for me to write," Barr said. "Wouldn't you hate to be known for the worst decision you ever made?" When asked what parks she would like to set future books in, Barr mentioned Voyageur National Park in Minnesota, and Florida's Everglades ("although I'm mosquito bait")... "Not Alaska because it's already been done so well by several others. But there's an employee exchange program with parks in other countries that has a lot of possibilities." Barr likes to keep Anna Pigeon in a self-contained world, which means that there will be no technological deus ex machina, just Anna's wits and knowledge and experience to save her. "When working with the national parks, you can't kill the animals and you can't do ghosts." "I absolutely love words. I love words for revealing things, and I love words for concealing things." Barr has 1600 books on her Kindle that she brings with her on tour. "I love holding my finger down on a word, and the definition magically appears." Nevada briefly worked with Ken Burns on his National Parks series. How does she write? She picks the park first, then a crime that's intrinsic to the park, and then she "injects" Anna. She tried to outline a book once, and that turned out to be like "the English assignment from hell!" A fellow writer and friend called Nevada to chat. Nevada said, "I thought you were busy writing?" "I was, but two of my characters got into a long conversation about masturbation, and I can't use it!" The evening always ends too soon when Nevada Barr is in town. If you'd like to watch the entire event, go to Livestream and be prepared to laugh! Signing those mail orders! Courtesy of Jeff K. of The Poisoned Pen. What a wonderful event. 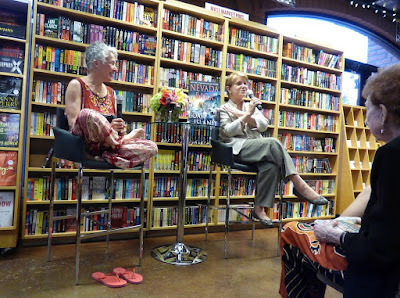 Nevada Barr is a favorite author and Anna Pigeon a favorite character. And, of course, the national parks are terrific settings. I spent three summer vacations years ago at Acadia National Park. Mount Desert Island is one of the most beautiful places on Earth. Standing on top of a mountain looking at Bar Harbor, sailboats, trees and more was a treat -- while eating homemade green apple pie and taking a few minutes to sit and read. Oh, lucky you, Cathy! Nevada Barr is such an interesting person, isn't she? Very glad you had a good time. I could listen to her all day, Margot! Firestorm and Blind Descent are two of my favorites also. I read those books quite awhile ago and I can still see images in my mind from those books. Blind Descent really surprised me on how much I liked it. I felt like I was crawling along inch by inch with them to take the body out of the cave. I never thought before how tight some of the caves could be. I have a new respect for caves and the people who explore them. I would love to hear Nevada Barr talk. I should have added that I have respect also now for people who do rescue work in caves. Blind Descent was proof of how much I liked Barr's writing because I do not "do" anything underground. I spent most of the book as a quivering mass of Jell-O. I have the utmost respect for anyone who explores caves or does rescue work in them. I honestly don't think I ever could.